I’m late to this, but it’s a good time to look at Fidel Castro’s extraordinary 24-day visit to Chile in 1971, when Salvador Allende, a Socialist, was in office. A couple of years ago, this blogger filed a Freedom of Information Act request with the U.S. government for documents on this visit, as it was something the Nixon administration watched rather closely. Such documents can shed light not only on U.S. policy but on the events themselves, as witnesses tell diplomats things they do not tell journalists and academics. How did Chilean and Cuban officials get along? What did the Chileans think of Castro’s extended visit? But first, a brief recap. It was supposed to be a 10-day visit. Fidel arrived on November 10, 1971 and embarked upon an extensive tour, from the Atacama Desert to Tierra del Fuego, visiting copper mines, vineyards, gas and oil installations and meeting with laborers, trade unionists, students, fellow Marxists—and the military. There are photographs of him alongside future dictator General Augusto Pinochet, who at the time was commander of the Santiago army garrison, so the two men must have engaged in some conversation. And he gave Salvador Allende was an AK-47, with his name inscribed, which the Chilean leader would use to kill himself in the presidential palace during the brutal military coup on September 11, 1973. Back to my Freedom of Information Act request, which made the rounds of the U.S. State Department, the National Security Agency, Defense Department and the Central Intelligence Agency. I got nothing from the State Department; the National Security Agency sent a letter in September of last year saying that my request had been reviewed and that the relevant material remains classified as TOP SECRET. “The information is classified because their disclosure could reasonably be expected to cause exceptionally grave damage to the national security,” the chief of the FOIA office wrote to me, then described the agency’s appeal process, which I then followed. Hopefully there’ll be more on this later. In October of this year I received a polite letter from the Defense Intelligence Agency (DIA) giving me a status update on my request. “Please by assured that our office is committed to processing your request as soon as possible as the DIA continues its efforts to eliminate the large backlog of FOIA requests.” My request was #139 of 232 in the Awaiting Response Queue, and there was a telephone number if I had any questions. The Weekly Summary dated 29 October 1971 is headed with the words, “Cuba Dusts Off Its International Image” and says that the Chile visit will be Castro’s first trip abroad since 1964. There was speculation that the Cuban leader might arrive in time to help Allende celebrate the anniversary of his electoral victory on 4 November (he didn’t) and that officials of both countries had refused to pinpoint the dates for the visit. The Central Intelligence Bulletin dated 9 November 1971 said that Havana’s decision to publicize details of Castro’s arrival “probably stems from a desire to reap the greatest propaganda advantage from the outset of the visit, though the degree of real enthusiasm among Chileans for it remains uncertain.” The length of the visit was not mentioned, the report says, and there is a redacted sentence, followed by the arrival of Castro’s advance party four days earlier. The 12 November Weekly Summary mentions Castro’s arrival in Santiago and that aside from a few minor incidents, “his reception was warm and friendly and large crowds turned out to greet him.” His four-member delegation, the report said, was “remarkably unspectacular and suggests the trip is not a business one.” The presence of the Havana army commander indicated that Cuba “realizes the importance of developing a “correct” professional relationship with Chilean military leaders.” One wonders whether the Cuban army commander had any contact with Pinochet. The next CIA bulletin, dated 26 November 1971, said that the Castro tour “has been successfully demonstrating Cuba’s solidarity with Chile and improving his international image.” Chilean Communist Party members were receiving him “cautiously,” and Castro “has been circumspect in his remarks, however, lest he be accused of meddling in Chilean domestic affairs” and that he was “even less bitter than usual about the US base at Guantanamo, saying only that Cuba “one day” would recover it without a shot being fired.” He had spent relatively little time with Allende, other than a two-day cruise to Chile’s southernmost city, Punta Arenas. It is dated August 19, 1959 and describes how Raul Castro, commander-in-chief of the Cuban armed forces, landed a plane in Santiago after a conference of foreign ministers had ended, ostensibly to take Cuban Foreign Minister Raul Roa Garcia home. “After a delay in debarking because no suitable ramp could be found, Major Castro was taken to the customs office like any tourist. The only leading Chilean greeting Major Castro was Senator Salvador Allende, unsuccessful 1958 Presidential candidate of a coalition of extreme Left-wing parties. “A year ago a little baby girl was born in Cuba. Due to complications, she required a tracheostomy and ventilator. She is a year old now, still needs the ventilator, but can go home with her parents who are doctors if they can obtain a ventilator. On $60 a month salary her parents could never afford to buy a ventilator if one was even available. It would have to be a special ventilator for an infant and run on electricity using room air, as oxygen would be impossible expensive. Meanwhile, last year in Watson Lake, Yukon the little 50-bed worn out hospital was replaced with a brand new one. 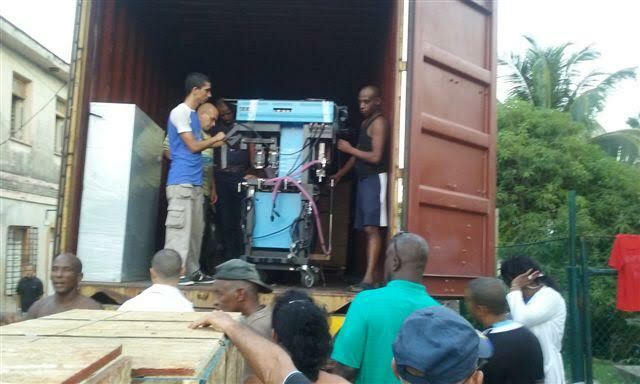 Much of the hospital’s equipment was left behind being replaced with new equipment. Now go back to June 2014. Educational consultants with the EFCCM [Evangelical Free Church of Canada Ministries] John and Naomi Hall met me at Shalom Clinic in El Salvador. John and Naomi just happen to live in Watson Lake, Yukon! Fast forward to spring 2015. John and Naomi learn of all the used by still useful hospital equipment to be disposed of from the closed Watson Lake Hospital. They contact me with a long list of medical equipment almost all of which would be extremely useful in overseas hospitals. They get permission from the Yukon Health Authority to donate it to MEMO. The problem: Trucking companies would charge $6000 to bring it to Thunder Bay. Guess what? The pastor of the EFCCM church in Watson Lake grew up in North Western Ontario and volunteered to drive his flat bed truck with all the equipment on it to Thunder Bay while he visited his relatives. The Halls paid for the cost of the diesel fuel. The stretchers, delivery table, monitors and boxes and boxes of stuff arrived in October. We have slowly been working at unpacking and checking all kinds of really useful medical equipment over the last three months. Now we go to the first week of this November. Martha Delgado goes to Cuba wit the team holding workshops on senior care in Havana and Santa Clara. While there she meets Dr. Montiel Yumar who tells her about the baby needing a ventilator. Back in Canada Martha asks me if MEMO could find a ventilator. I tell her we don’t have one, but who knows. The next week I am going through boxes from the Yukon. You guessed it! There was a ventilator suitable for a child weighing more than 22 lbs. Runs on electricity 110V using room air with battery back p for power failures up to 10 hours long. As well the Halls had included three brand-new breathing tubes to connect the machine to the baby’s tracheostomy tube. It was compact weighing about 8 pounds. Legislative staffers say Cuban officials have made clear that if Congress members meet with dissidents, they will not get access to high-ranking officials such as First Vice President Miguel Diaz-Canel, the man expected to be the next president of Cuba who has met with U.S. politicians like House Minority Leader Nancy Pelosi and Sen. Patrick Leahy of Vermont. Miranda Diaz explained the criminal justice system in Cuba to the shocked Americans. When a Cuban is arrested, he can be jailed without the right to see a lawyer or make a phone call for 72 hours. After a week, the prosecutor decides whether to grant the person bail or not. At that point, he or she has just five days to hire a lawyer and does not get access to his or her criminal file until the case is through. This is despite the fact the island country claims an “innocent until proven guilty” philosophy. Pope Francis, who recently visited Ecuador, Bolivia and Paraguay, is scheduled to visit Cuba and the United States in September. Needless to say, it will be an interesting trip and much has been made of his role in helping the two countries improve relations. But here’s a look at an earlier Vatican gesture in Cuba, in wake of an incident in the Florida Straits which took place 21 years ago, with a transcript of an ABC broadcast on the case, and thanks to the Cuba Archive project (http://cubaarchive.org/home/index.php ) for making it available. TED KOPPEL Three and a half years ago, in the summer of 1994, something terrible happened out there, seven or eight miles out at sea, off the northern coast of Cuba. It was an incident that went all but unnoticed in the US media. The Cuban-American community protested but they protest a lot and as I say, we in the mainstream media all but ignored it. The Vatican, however, did not. A letter of condolence speaking in the name of the Pope was sent by the Vatican’s secretary of state to Jaime Ortega, the Archbishop of Havana, who passed it on to the survivors of the incident and to their families. And that created a ripple which caused a ground swell, the full impact of which is still building. Liz Balmaseda is a columnist for “The Miami Herald” who specializes in Cuban affairs. LIZ BALMASEDA What the letter from the Pope did was it really gave strength to the church in Cuba so the church, so that the archbishop could turn around and denounce this act. TED KOPPEL (VO) What happened occurred at night at sea in the middle of July in 1994. The time is important because it wasn’t all that long ago, not, in other words, in the bad old days of mass arrests and widespread executions. Seventy two Cubans, men, women and children, slipped out of this harbor aboard a tug boat. They were bound for Florida. Their boat was followed out to sea by three Cuban fire boats. What happened next we learned from some of the survivors, two of whom ultimately made it to Miami, while the other two risked arrest by talking to us here in Havana. SERGlO PERODIN (Miami) (through translators) This boat came directly for us, cut us off and attacked us without a word, without saying anything to us or telling us to stop. MARIA VICTORIA GARCIA (through translators) They told us stay here and show them the children so that they don’t shoot at us. One boat comes up behind us and they started ramming the boat. JANETTE HERNANDEZ (Miami) (through translators) As we were showing them the children, they started spraying strong bursts of water at really high pressure, right at us. SERGlO PERODIN (through translators) With the pressure hoses, they blew apart our boat’s windows, its doors, they wrecked our radio and we knew then that their intention was to sink our boat. JANETTE HERNANDEZ (through translators) I remember the banging and the noises from inside as the boat was sinking. In the water, everything is louder. That is what I heard. And I still hear it at night in nightmares. MARIA VICTORIA GARCIA (through translators) I don’t know how to swim but I said I can’t sink with this boat. I was holding onto a pipe and I had my son right in front of me and I held him and then I went down. I sank. When I made it to the surface again I found a body floating that I know was Rosa. TED KOPPEL (VO) Maria and her son held onto the body of her friend. lt was the only thing keeping them from sinking again. REYNALDO CARRAZANA (Havana) (through translators) At the moment the boat sank, the survival instinct is the strongest. At that moment, I just thought of saving myself. MARIA VICTORIA GARCIA (through translators) There was a boat just in front of me and it’s showing its light on me and I said, “pull us up.” And it was the same crewmen. And I said pull us up, pull up the boat because he’s going to drown. And he said, “If you want to be rescued, wait for the Coast Guard boat.” And he turned the boat around. SERGIO PERODIN (through translators) They started going around us in a circle fast creating a whirlpool that sucked the people down to get rid of everybody because they didn’t want to leave any witnesses to this tragedy. REYNALDO CARRAZANA (through translators) I didn’t know how to swim. I just floated. It seems that the boat’s freezer was nearby and I hung onto it. And a number of people were there hanging onto it, too. MARIA VICTORIA GARCIA (through translators)I tried to reach that group. When I get there I hold onto the board because they were holding onto a piece of wood. I tried to hold onto the piece of wood. It was the ice pot that had come off the tugboat. But there were many people hanging onto it and when I held onto it, it seems that my weight made the boat overturn and a lot of people fell on me. And it was then that I let go of my son and I tried to grab him again but I couldn’t. It was so fast, he just went and I couldn’t grab him. SERGlO PERODIN (through translators) We saw in the distance a boat with a Greek flag that appeared to be what stopped them. lt looked like the boat was watching what they were doing, the murder they were committing. So they stopped and decided to pick us up. JORGE GARCIA (Havana) (through translators) When I asked my daughter, “What about Juan Mario?” “Papa, he’s lost.” “And Joel?” “Papa, he’s lost.” And Ernesto? “Papa, he’s lost.” And then we knew that other members of the family were all lost, 14 in all. JANETTE HERNANDEZ (through translators) Fidel is the only one who could have given the order to sink the boat. And soon after the boat sank, the captain of one of the fire boats was decorated as a hero. TED KOPPEL (VO) Jorge Garcia lost his son. In this picture, you can see a chain around his son’s neck. Against all odds, it was brought back to the father. ANNOUNCER ABC News Nightline continues. Once again reporting from Havana, Cuba, Ted Koppel. TED KOPPEL The Castro government had dismissed the tugboat sinking as an accident and insisted that no one in the government could have played any role. But then the church cleared its throat. LIZ BALMASEDA I think the letter that came from the Pope really showed that there was an important international ring to this incident, that somebody at least, somebody as important as the Pope knew what had happened. JANETTE HERNANDEZ (through translators) He sent us his condolences for what had happened and when I received it, I said to myself, well, at least people knew about what happened. TED KOPPEL (VO) Janette Hernandez and her husband, who also survived the sinking of the tugboat, went to sea again, this time on a raft, and made it to Miami, where they have created a new life. Maria Garcia, who lost 14 members of her family, also lost her job. She says she is under constant surveillance and risked arrest by talking to us. MARIA VICTORIA GARCIA (through translators) I will be happy if the Pope, among his many concerns, mentions the question about the tugboat. What has happened about the incident with the tugboat? What has been done? I would like the Pope to ask Fidel that question. QUANA CARRAZANA (through translators) I see him as a messenger of God and since God always wants the best for human beings, he’s going to bring us that happiness we need, at least spiritually, so that little by little this comes to an end. TED KOPPEL (VO) Quana Carrazana’s husband, daughter and granddaughter were among the dead. She lives with her son in poverty and says she is also harassed by state security. QUANA CARRAZANA (through translators) The jails are full of political prisoners. As a result of this interview, I may be arrested. But I’m not afraid if they arrest me, because I live for my son. If they kill me, I don’t mind, because I’m already dead. If they actually kill me, I don’t mind. REYNALDO CARRAZANA (through translators) He’s going to say mass. People are going to feel fine while he’s here and then things will go back to normal. People will go back to their daily grind, live their day to day difficult life, sweat and toil and everything will be the same. TED KOPPEL (VO) Reynaldo, Quana’s son, had to leave school. He says he’s periodically picked up or threatened. He supports his mother by making furniture by hand. His mother is afraid that Fidel Castro will warmly greet the Pope. QUANA CARRAZANA (through translators) I don’t want that moment to come. I would turn my face because it’s as if God were embracing the Devil. God cannot embrace the Devil ever. The Pope’s visit will help Fidel because it will look to the world as if Fidel has become more open. But for the Cuban people, nothing will change. TED KOPPEL (VO) The men who survived were thrown into prison for several months. When they were released, Sergio Perodin made his way into exile in Miami. SERGlO PERODIN (through translators) I have always been against those who travel to Cuba to attend one of the masses the Pope will say there. It has never occurred to me the idea of returning to Cuba as long as this dictatorship exists. REYNALDO CARRAZANA (through translators) I’m planning to go. Let’s see if they let me. They can warn me. Here they can warn you. They see you around, they can simply arrest you and that’s it. They don’t tell you don’t go, but they say if you go, there might be consequences. JORGE GARCIA (through translators) I’m planning to go see the Pope, go to the mass. Probably he will not know that I am there. I will just be one in the crowd. But I will go there because I have a debt of gratitude to the Pope that I want to pay. TED KOPPEL I’ll be back with a closing thought in a moment. TED KOPPEL The Soviet dictator, Joseph Stalin, once mocked the power of the Pope with his famous rhetorical question how many divisions does the Pope command? Fidel Castro has a more subtle understanding of the Popes influence. By welcoming John Paul to Havana tomorrow, Castro may believe that some of the Pope’s moral authority will rub off. But the newly revitalized Catholic Church of Cuba has already made it clear that the vicar of Christ will be here visiting the people of Cuba, not engaging in political dialogue with its leaders. A simple letter of condolence from the Pope has already showed that it could make waves in this country. A Papal visit may yet stir up a storm. That’s our report for tonight. I’m Ted Koppel in Havana. For all of us here at ABC News, good night.